Assembled Dimension (L x W x T): 66"X 49" X 83"
Size Of Main Frame: 2" X 2"
Adjustable Height Of Barbell Bars: 22 Position Holes Ranging From 12.2" To 70.5"
Length Of Pull-Up Grip Bar: 28"
Diameter Of Pull-Up Grip Bar: 2"
Diameter Of Solid Dual Mounted Safety Bars: 1"
Length Of Lat Pull-Down Bar: 38"
Diameter Of Lat Pull-Down Bar: 1"
Length Of Low Row Bar:18"
Diameter Of Low Row Bar: 1"
Diameter Of Sliding Pulley: 3-1/2"
1. Assembly Required With Instruction. 2. Press Bench, Olympic Bar And Weight Plates In The Pictures Not Included. 【Heavy-Duty Construction】1500 Super Max Weight Capacity, made of 2.4" x 2.4" square steel frame with a scratch proof powder coated finish, resist rust and corrosion, added extra durability and designed for long-term use. Assembled dimensions of 66"x 49" x 83". Large walk in space providing easy side to side movement. 【Variable Positions with 4 Safety Supports Bar】Our barbell training station equips with 4 durable electroplate solid steel weight bar supports, compatible with 7' Olympic bar. Among them are 2pc of J-shaped support hooks with weight capacity of 600lbs and 2pc of dual mounted safety bars with each set combined weight capacity of 1500 lbs. Multiple position holes makes adjustable height range from 12.2" to 70.5", allows you to lift heavy weights safely and store barbells tidily. 【High Density Rubber Grip Chin Up/Pull Up Bars】Made of 28 inches long electroplate solid steel bar, diameter of 2 inches with a weight capacity of 600 lbs. Well trained your upper back, shoulder and arm muscles. 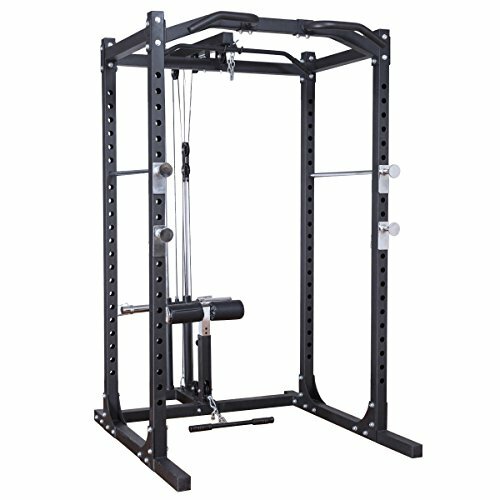 【Included a Lat Pull-Down and Low Row Attachment】 included two electroplate solid plate loading carriage, a electroplate sliding pulley, a 38" electroplate solid lat pull down grip bar and a 18" low row grip bar. Plate loading lat pull down offers a full range of shoulder motion while the low row pulley can be used for seated rows, upright rows and curls by using the foam cross bar. Helps to build a wider, beefier Back and/or stronger and bigger Biceps and Triceps. 【All-in-one Exercise Station】4 muscle-sculpting workout stations, include pull-up, incline/supine presses, lat pull-down and low row station. Well trained your military, chest, back, arm and legs muscles. A great space saving unit for every home gym to target and strengthen core muscles in your humble abode with this full cage home workout system.